"Where There is No Cosmetic Counter: How Not to Look like a Zombie - Even After the End of the World as You Know It"
When discussing preparedness, whether it’s on my survival and preparedness for women website SurvivorJane.com, on social media networks like Facebook - Twitter - Pinterest - LinkedIn or addressing a group or a conference, I invariably get approach by men (no, not in that way), and asked how they can motivate the women in their lives to get involved in disaster preparedness. What I share with these men, or anyone else for that matter, is that women are just as uncomfortable at the thought of wearing camouflage-fatigues as men would be at wearing high-heeled shoes. Which is to say, men and women speak a different language. We interpret information differently. So it could be that the approach men are using when discussing disaster preparedness has more to do with what they are talking about - guns and ammo, camouflage clothes, underground bunkers and many even a little doom and gloom. Women prefer to think about things like family, fashion, make-up and lots of good smelling things. But even if the resistance isn’t the man’s approach, the reluctance may simply be they don’t want to give up their “woman-ness”. So is it really that difficult to see why some women would be reluctant to jump on the disaster preparedness wagon? To some it would mean giving up these comforts and luxuries. Listed below are the main categories of the table of contents - each having their own subcategories. The book is 272 pages and is a valuable compendium of recipes and remedies for both health & beauty using simple ingredients we have in our home pantries and gardens and even things found in the wild. FACIAL CARE & HAND CARE - Acne Remedies - Moisturizers for your face & hands in cold climates. FOOT CARE - You have to take care of your feet in a survival situation - PERIOD. This is just to give you an idea of some of the things available for men - some of the ingredients listed I have been using myself for years. I will also add that Jane lists the health benefits of the main ingredients including the vitamins, minerals & cofactors - very useful information. 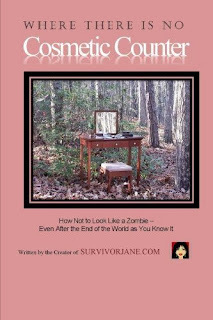 In closing, I would say that Survivor Jane's book is a valuable addition to your Preps - Well written and easy to understand - 5 STARS! Prepper, Mom & Teenager Approved! I instantly realized this book is not just for the preparedness minded. It is a wonderful resource for ALL females of ALL ages, especially those who have concerns about the ‘stuff’ that they put in our everyday lotions and potions. So attention prepper chicks; homesteaders; self-sufficient and ladies of ALL classifications, you will LOVE this book! I would also recommend this book for men; there are several sections that would be useful for the ‘guys’ in our lives. (Not just for their own personal use but as an insight into things that you might have to deal with for the ladies involved in your preparedness plans). Most of the recipes SJ uses include everyday items that we have in our home. Yes, there are a few extra things that would be nice to have on hand but I have made my wish list and will be picking up those items over the next few weeks. I too will be the ‘mad scientist’ creating and concocting some wonderful daily and prep related health and beauty aid products. I figure what I pay for 1 good bottle of fancy-shmancy moisturizer I can get a hardcopy of the book and the few other things on my wish list and be set for a VERY long time! One of the first things I learned was coconut oil is my new best friend, I can cook with it AND moisturize! SJ does a beautiful job of describing and including easy-to-understand instructions. I joke about being ‘domestically challenged’ but seriously if I am given good instructions I can do it, therefore you can too. She also handles that ever so dreaded topic of feminine hygiene very eloquently….. It’s not fun to think about but we have to. This wonderful resource will hold a very special place in our personal library and used frequently!